The glucose transport protein type 1 (GLUT1) deficit causes a chronic brain energy failure. The classic phenotype of GLUT1 deficiency syndrome is characterized by: Mild to severe motor delay and mental retardation; infantile-onset epilepsy; head growth deceleration; movement disorders (ataxia, dystonia, spasticity); and non-epileptic paroxysmal events (intermittent ataxia, periodic confusion, recurrent headaches). During last years the classic phenotype of this syndrome, as originally reported, has expanded. We report the atypical phenotype of a boy with GLUT1 deficiency syndrome, characterized by mild mental retardation and drug-resistant absence seizures with onset at the age of 6 years, without movement disorders nor decrease of head circumference. A prompt diagnosis of this disorder is mandatory since the ketogenic diet might represent an effective treatment. We describe the atypical phenotype of a boy with GLUT1 deficiency syndrome. The patient's family history was positive for: A not better specified psychiatric disorder and somnambulism in the mother; epilepsy and mental retardation, in a paternal uncle and a paternal cousin, respectively. The mother had some spontaneous abortions. He was an only child, born at the 36 th week of gestation by Caesarean section due to hypertensive gestosis, after a two-placenta twin pregnancy, with the intrauterine death of the other fetus. Apgar Index was 7 (1') and 8 (5'); birth weight was 3040 grams. Cyanosis and jaundice at the birth were reported; jaundice was treated by phototherapy and exsanguinotransfusion. He had a bilateral nuclear congenital cataract. Height and weight growth were normal. There was a mild, global delay of psychomotor development. At the age of 4 years 1 month, EEG tracing during wakefulness, performed due to the psychomotor retardation, was normal. From the age of about 4 years he has suffered from headache several times monthly, sometimes associated with nausea and vomiting, treated with paracetamol. At the age of about 6 years, he started to present, especially in the morning, short but frequent (even several times a day) episodes of loss of consciousness, eye closure, inconstant eyelid myoclonia. The events could occur isolated or close together resulting in falling asleep but showing amelioration on awakening. The drowsiness associated with the long clusters of these events was a major problem in his everyday life, especially at school. When he came to our observation, he was 9 years 8 months old. Neurological examination showed only a mild, aspecific incoordination; head circumference corresponded to the fiftieth percentile. He often appeared tired, sleepy, and lazy. Neuropsychological evaluation showed a mild mental retardation (Wechsler Scale), stable during the follow-up, with a significant prevalence of verbal intelligence quotient (IQ) versus performance IQ; an aspecific learning disorder was evident. 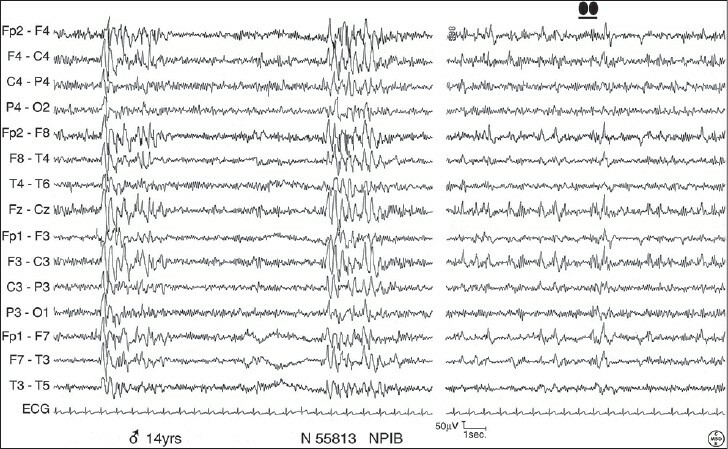 EEG revealed diffuse paroxysmal abnormalities and several brief absence seizures have been recorded [Figure 1] and [Figure 2]. Electromyography as well as motor and sensory nerve conduction study was normal. Brain MRI was normal. High-resolution kariotype and search for fragile X syndrome were normal, as well as a metabolic screening including creatine kinase, lactic acid at baseline and after exercise, thyroid hormones, tests for celiac disease, ammonia, serum and urinary aminoacids, and urinary oligosaccharides. Absence seizures were drug resistant to ethosuximide, levetiracetam, lamotrigine, and valproate, with only transient improvements after beginning a drug. After antiepileptic therapy start, we found episodic, mild postural and tremor-like action dyskinesias in the arms. At the age of 15 years, mainly due to the drug-resistant absence seizures, we performed the molecular analysis of the SLC2A1 gene. The polymerase chain reaction sequencing of all exons revealed a nucleotide deletion in heterozygosity, "c.1336_1338del", causing the loss of one amino acid (isoleucine: p.Ile446del). Genetic testing was negative in both parents. We chose not to give the lumbar puncture to avoid causing the patient excessive discomfort. A ketogenic diet was started and we noted a fast, marked clinical improvement. The boy became more responsive and active, while absence seizures and headache frequency decreased. However, patient's compliance with the prescribed dietary regimen was so poor that after 1 year we decided to stop the diet. Only a few days after the discontinuation, the boy showed clinical worsening, which made him willing to resume the diet. The authors would like to thank Massimo Armaroli and Elena Zoni for technical assistance and Cecilia Baroncini for linguistic support. 1. De Vivo DC, Trifiletti RR, Jacobson RI, Ronen GM, Behmand RA, Harik SI. Defective glucose transport across the blood-brain barrier as a cause of persistent hypoglycorrhachia, seizures, and developmental delay. N Engl J Med 1991;325:703-9. 2. Brockmann K. The expanding phenotype of GLUT1-deficiency syndrome. Brain Dev 2009;31:545-52. 3. Verrotti A, D′Egidio C, Agostinelli S, Gobbi G. Glut1 deficiency: When to suspect and how to diagnose? Eur J Paediatr Neurol 2012;16:3-9. 4. Klepper J. GLUT1 deficiency syndrome in clinical practice. Epilepsy Res 2012;100:272-7. 5. De Giorgis V, Veggiotti P. GLUT1 deficiency syndrome 2013: Current state of the art. Seizure 2013;22:803-11. 6. Pearson TS, Akman C, Hinton VJ, Engelstad K, De Vivo DC. Phenotypic spectrum of glucose transporter type 1 deficiency syndrome (Glut1 DS). Curr Neurol Neurosci Rep 2013;13:342. 7. Pong AW, Geary BR, Engelstad KM, Natarajan A, Yang H, De Vivo DC. Glucose transporter type I deficiency syndrome: Epilepsy phenotypes and outcomes. 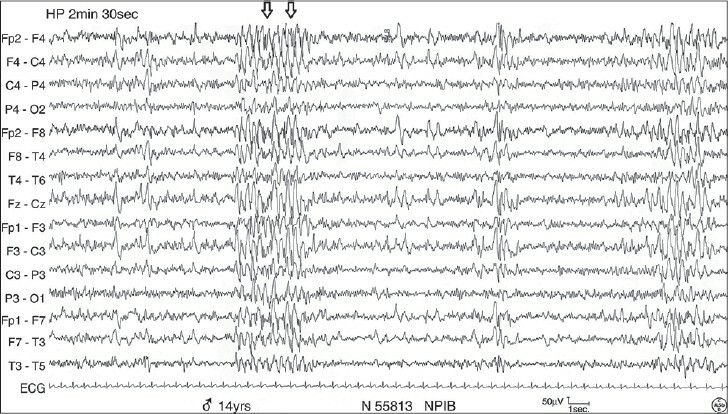 Epilepsia 2012;53:1503-10. 8. Leen WG, Klepper J, Verbeek MM, Leferink M, Hofste T, van Engelen BG, et al. Glucose transporter-1 deficiency syndrome: The expanding clinical and genetic spectrum of a treatable disorder. Brain 2010;133:655-70. 9. Suls A, Mullen SA, Weber YG, Verhaert K, Ceulemans B, Guerrini R, et al. Early-onset absence epilepsy caused by mutations in the glucose transporter GLUT1. Ann Neurol 2009;66:415-9. 10. Mullen SA, Suls A, De Jonghe P, Berkovic SF, Scheffer IE. Absence epilepsies with widely variable onset are a key feature of familial GLUT1 deficiency. Neurology 2010;75:432-40. 11. Anand G, Padeniya A, Hanrahan D, Scheffer H, Zaiwalla Z, Cox D, et al. Milder phenotypes of glucose transporter type 1 deficiency syndrome. Dev Med Child Neurol 2011;53:664-8. 12. Striano P, Weber YG, Toliat MR, Schubert J, Leu C, Chaimana R, et al. ; EPICURE Consortium. GLUT1 mutations are a rare cause of familial idiopathic generalized epilepsy. Neurology 2012;78:557-62.